Customer Reviews For "Homemade Worship By Handmade People"
Sometimes music can begin to feel overproduced while technology advances. Not so with Rend Collective. This album almost feels like it was recorded live, thanks to the simple production of it. Build Your Kingdom Here will always be an amazing song in every way, the only problem is a few of the songs are a bit forgettable sometimes. Fantastic CD. It is easy to listen to, great lyrics, excellent tunes! I would buy this again. What a rich sound! They refresh some old classics, and have some of their own lovely tunes. They provide a more alternative sound, and some beautiful harmonies! Definitely recommend. 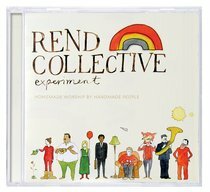 Went to see Rend Collective Experiment at the Mandela Hall, Belfast recently - fantastic! They played all the tracks from this album which is totally addictive (in a spiritual way, of course!). These guys are so sincere and so musically and vocally talented. Can't make my mind up which track I like best, they're all so good. I am sure God will touch many hearts through their music.